Admire dogs with waves over tight curls? How many wavy haired pooches can you name? See what dogs are known for this hair type and get a few tips on wavy coat care. The Chesapeake Bay retriever (the "Chessie") is a hunting dog of 55 to 80 pounds, a water retriever, whose outer coat is described as oily, harsh and wavy, with a soft, dense undercoat. His coat may be various shades of brown, or one of two color descriptions unique to the breed: sedge, or all shades of red from pale chestnut to mahogany, and deadgrass, which has no red tones and describes the color perfectly. The flat-coated retriever is similar in size, but finer and lighter in build, with a slightly wavy coat in black or liver. He's also a sporting dog and makes a great family pet. The Kerry Blue terrier has a soft, wavy single coat of a distinctive bluish gray color. He's an active dog of 30 to 40 pounds who loves his family, but can be standoffish with strangers and reactive with other dogs. The Soft Coated Wheaten terrier, also of Irish origin, is similar in size, with a similar coat texture of an equally distinctive color, that of ripe wheat. He is more mellow than the Kerry Blue and likely to be better with children and other small animals. While the coat of the Kerry Blue can be cut short and sculpted to show off his shape, the Soft Coated Wheaten's coat must be long enough to "flow" when he moves and is not plucked or clipped. The Portuguese water dog, also 40 to 50 pounds, has a single coat that can be curly or wavy. He can be clipped to look like a lion, or trimmed to 1 inch all over, similar to the puppy clip of a poodle. He's a real water and boat dog, like the Chessie, bred and trained to retrieve gear lost overboard and to carry messages from boat to boat and also back to shore. The best-known Portuguese water dog today is Bo, first dog of the Obama White House. 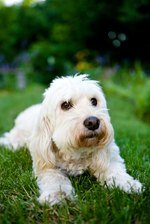 The Havanese has a long, wavy double coat in almost any color and weighs 7 to 13 pounds. He looks like a lap dog, and has a cheerful personality, an eagerness to please and a sociable nature, getting along well with children and other pets. He's perfect for an apartment, needing only moderate exercise, and he's even a good watchdog, announcing visitors clearly. The white Bolognese looks a lot like his close cousin, the Bichon Brise, but with a longer, wavy coat instead of the Bichon's curls. Look for his portrait in the works of Old Masters, including Titian and Goya. He loves children, but be sure to supervise his interactions with them -- he's bold, but so little that he could get hurt easily. Whether single or double, wavy coats seem to shed less than other coat types, which makes these dogs good for the fastidious and the allergic. Some of this perception is created by loose hair that gets caught in the coat, where it can mat and tangle. All wavy-coated breeds need frequent brushing to remove loose hair and any foreign objects. A slicker brush or a pin brush works well, as long as it's used gently to avoid pulling the hair or scratching the skin. Bathe him as often as he needs it, but not so often as to dry out the skin and coat. If it gets to be too much for either or both of you at home, there's always the professional groomer.